“He may be disfigured or disabled. He might have severe acne scars, or scoliosis.” “That’s curvature of the spine,” Dailey added. “Is that a hunch?” I asked. In a pool bar: I bought two beers and carried them over. “Are you looking for a game, or do you want to play with youself all night?” I asked. 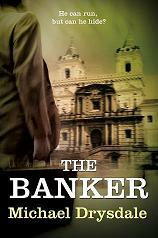 The Banker has reached a new high in the UK Kindle rankings – #480 or #43 in thrillers.